A couple of hours ago, a new Best Bottom diaper was announced: the Cookie Monster diaper. I saw it and was more than a little bit tempted. Sure, there are things that got me interested before. Like the fact that you can just change inserts and continue to use the same shell (which is my favorite thing about Flip diapers and GroVia hybrids). The thing that held me back was, again, the awareness that I really don’t need to grow my cloth diaper stash. So, why now? Why this diaper? I’m not sure if it’s the color (love that blue!) and the trim combo, or if it’s the name. (Norton loves the Cookie Monster.) But regardless of what it is that’s really sparked my interest in the new Best Bottom diaper, I’m definitely interested. 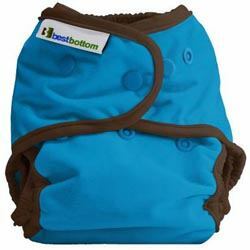 Have you ever tried Best Bottom diapers? How did they work out in your stash? I’m contemplating the best bottoms and wonder if you’ve tried the hemp inserts? Many moms I’ve talked with say to skip the medium, as the large is almost the same size…wondering if the hemp are absorbent enough? Also my babies tend to get really chubby before they start walking, how do you find the fit? Experience with a fluffy baby? I actually sold off all of my large inserts because they were too high on my tiny two year old. I stick with mediums. I have no love for the hemp. They’re absorbent, sure. But they shrink. A LOT. I had a large hemp insert, and it eventually shrank down to be between a small and a medium in size. I have a friend who has a rather big baby, and he does fine in BBs.